When I was a camp counselor, various stories were told at the end of meal time. These stories were meant to stimulate conversations for later, when kids and their counselor returned to their cabins for the night. The following story hit me hard, so I’ve never forgotten it. “There once was a girl with a very bad temper. she must hammer a nail into their wooden fence. Over the next few weeks, as she began to control her temper,the number of nails she hammered into the fence gradually dwindled. Finally, the day came when the girl didn’t lose her temper at all. She became so proud of herself and she couldn’t wait to tell her father. Pleased, her father suggested that she now pull out one nail for each day that she could hold her temper. The days passed and the girl was finally able to go back to her father and tell him that she had pulled out all the nails. Very gently, the father took his daughter by the hand and led her to the fence. The little girl listened carefully as her father continued to speak. Later, I came to realize why it had special meaning for me. Unlike the girl in the story, my anger was used as a defense-mechanism – to protect me from my critical family. I learned, unconsciously, that anger made me feel stronger – People backed off! It became so automatic that I didn’t even notice the damage I was causing. But like so many of our childhood coping skills, I couldn’t even turn it off in circumstances that didn’t involve my family. So when I heard this fable, I woke up. I had to become aware of anger’s purpose for me. I learned that my defenses were not who I was – they are coping skills. I had to decide that I didn’t want to be that way anymore – after all, I was no longer a child – and I learned, instead, to cope with the underlying feelings. I taught myself that being sad, confused or scared, were “okay”. If anger is expressed without awareness, it will damage all of your relationships. Take the time to learn to communicate effectively; journal to learn to understand your feelings; get a book about Assertive Communication. Worth reading, from Off the Web! Are you one of the legions of men who suffer from “Nice Guy Syndrome” ? – a set of personality, attitude, and behavioral traits described by Dr. Robert Glover, author of No More Mr. Nice Guy. Nice Guys take a passive approach to life and relationships. Instead of standing up for themselves, they let others walk all over them. They’re pushovers and perennial People Pleasers. Nice Guys have a hard time saying no to requests — even unreasonable ones. They’re considerate to a fault. When they want or need something, they’re afraid to ask for it because they don’t want to inconvenience others. Nice Guys also avoid conflict like the plague. They’d rather get along than get ahead. At first blush, Nice Guys seem like saints. They appear generous, flexible, and extremely polite. But if you scratch beneath the surface, you’ll often find a helpless, anxious, and resentful core. Nice Guys are often filled with anxiety because their self-worth depends on the approval of others and getting everyone to like them. They waste a lot of time trying to figure out how to say no to people and even then, often end up still saying yes, because they can’t go through with it. They don’t feel they can go after their true desires, because they’re locked into doing what others say they should do. Because “go with the flow” is their default approach to life, Nice Guys have little control over their lives and consequently feel helpless, shiftless, and stuck. They’re also typically resentful and vindictive because their unspoken needs aren’t being met and they feel like others are always taking advantage of them – even though they’re the ones who allow it to happen. In worst-case scenarios, the Nice Guy’s pent-up resentment from being pushed around will result in unexpected outbursts of anger and violence. He’s a volcano waiting to erupt. So what’s a Nice Guy to do? How can he regain some control over his life and quit being such a pushover? Some Nice Guys think the solution is to swing to the other extreme and go from being passive to aggressive. Instead of meekly submitting, they feel like they have to dominate in every situation. They seek to get their way in everything, no matter what. Aggressiveness, while definitely appropriate in some instances, isn’t a very productive communication style in most cases. In fact, using a persistent, aggressive communication style can often backfire by creating resentment and passive-aggressive behavior in the very people you’re trying to control. Instead of passivity and aggressiveness, the best approach lies somewhere between the two. The sweet spot for communication and behavior is called assertiveness. The highest praised piece of advice, according to the author, is to rise above the minutia of daily life and commit to bringing out the best in your partner. You can’t do this without understanding what it is that your spouse truly wants. That may sound easy, but isn’t. In the short term, you might know she wants a promotion, or he wants to live in the country. But that is not the “high secret self” you need to know. The “high secret self” exists apart from daily desires and even apart from the twists of fate and fortune that get in the way. And when your partner has given in to his or her least attractive tendencies, this is the moment when you must see through the annoying, demanding, complaining, failing, faltering wreck in front of you—and find the strong, kind, fascinating, functional person you know your spouse wants to be. You have to learn to be critical without criticizing. The origin of the word critic is the Greek word kritikos, which does not mean “able to pick at flaws incessantly” but does mean “able to make judgments.” This is a crucial difference. The kind of criticism that helps marriage is the kind you learned in English class: studying something so well that you can find its hidden patterns and its deeper truths. If you apply this kind of criticism in marriage, it is actually possible to stop a spouse in mid-spiral (sometimes even in mid-sentence!) and say, “Excuse me, no offense, but you are not being the person you want to be.” The pronoun is vital. The difference between “who you want to be” and “who I want you to be” is the difference between encouragement and nagging: spark and ash. Worth reading from off the web! Abusers are highly deceptive and the victim, as well as others, have no idea that he is being abusive at all. He purposefully undermines his victim’s individuality and confidence by dominating conversations and suppressing her identity, making her into a mere object for his purposes. He minimizes anything about her, including her opinions, accomplishments, concerns, feelings, or desires. This causes her to do the same and she learns to minimize herself as well. He has a chronic attitude of disrespect towards his partner. A respectful relationship is not abusive and an abusive relationship does not contain respect. An abuser views his partner as his property, which allows him to feel powerful and in charge. It is essential for an abuser to feel this way because he has a fragile ego and delicate sense of self. Without feeling more powerful than his partner he feels weak and vulnerable. Feeling any sense of vulnerability taps into his sense of powerlessness which he is unwilling to experience for any reason. As long as he sees himself in the “one up” position his fragile ego is kept at bay. Abuse is caused by the belief system of the abuser. The abuser has developed a deeply ingrained sense of superiority and entitlement which does not go away by learning how to manage anger or resolve conflicts. Abusers use anger to control. They engage in conflicts to abuse their partner; show their superiority; and keep intimacy away. Since intimacy requires vulnerability, a feeling abusers avoid at all costs, they have no interest in developing such closeness. Abuse is not the same as conflict. A conflict involves a difference of opinion. Abuse involves the need for the abuser to stifle the feelings, thoughts, opinions, and values of the abused. An abuser refuses to accept any accountability or responsibility for any of the problems in the relationship. His hallmark attitude is one of superiority and blame. It is not the conflict that is the problem. The abuser caused the conflict in the first place. There can be no resolution. (1) They are unhappy and they don’t know what to do with their emotions. (2) They dump their rage and shame on others. (3) They may have a narcissistic or anti-social personality disorders. (4) They feel in control, powerful, strong, and superior, which helps them keep all weak, needy, and vulnerable emotions hidden. (5) Some people abuse because they were taught this as children and operate out of this inner working relationship dynamic. Whether abuse is physical, sexual, verbal, emotional, financial, spiritual, or some rendition of all of these, there are some basic components of abuse; these are: blame, criticism, neglect, oppression, minimization, rigidity, ridicule, lies, invalidation, lack of accountability, no remorse, no apologies, repeated name calling, double standards, violence, and a consistent lack of empathy. Realize that abuse, like addiction, is a chronic “disease” that progresses with time, meaning it only gets worse. Can an abuser be cured? while he is never going to be perfect, when he messes up, he apologizes, shows insight into what he did wrong, shows remorse, and changes. Alcoholics can never even have one drink ever again in order to maintain sobriety. Abusers can’t be like “normal” people who may be rude or disrespectful at times. Recovery for an abuser needs to be different from what comes natural for the partner. Coddling an abuser and showing him empathy only exacerbates his entitlement. Recovery for an abuser requires that he does not allow himself to ever be rude, disrespectful, entitled, or invalidating ever again. Instead, he is humble and compassionate at all times. No excuses. Sharie Stines, Psy.D. is a recovery expert specializing in personality disorders, complex trauma and helping people overcome damage caused to their lives by addictions, abuse, trauma and dysfunctional relationships. Sharie is a counselor at LIfeline Counseling & Education Inc., in Whittier, California (www.lifelinecounseling.org). Worth reading! From Off the Web! Love may be intoxicating, but trust is what makes it safe. Trust is based on a shared understanding about what each person in the relationship expects of the other. The wise couple develops an explicit, concrete agreement about what is and is not okay in terms of interactions with, and especially attractions to, people outside their relationship. When they have absolute confidence that the other person will stick with the agreement, they each relax and trust. Creating Trust in a Relationship By Marie Hartwell-Walker, Ed.D. You have to banish contempt. Contempt is an acid, and it etches ugliness into love. To banish contempt means that when your husband has given in to his least attractive tendencies, his most fearful, or fearsome; when your wife has lost her focus, her patience, or her heart … This is the moment when you must see through the annoying, demanding, complaining, failing, faltering wreck in front of you—and find the strong, kind, fascinating, functional person you know your spouse wants to be. If we don’t develop a sense of grace and an open loving heart, then we should at least let our partner go. It is a very crude, immature, and base character who thinks the only hold he or she has on the other is to keep them feeling insecure about themselves. I remember reading somewhere that the average person has about 3000 thoughts per minute, along with the corresponding emotions, expectations, and conclusions. I don’t know how they came up with 3000, but lets assume it’s true – That’s a lot of stuff going on! If you want to be clear and congruent in your communications, it’s essential that you slow this process down. You have to learn how to check in with yourself. 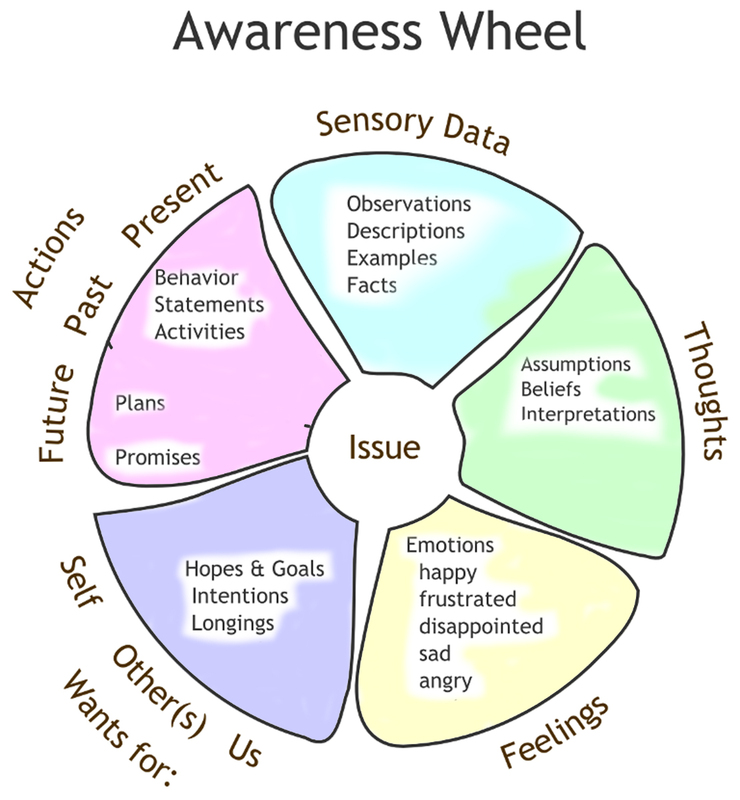 One of the tools I use with my clients in therapy is called The Awareness Wheel. Once mastered, it helps the user understand their experiences (awareness), and, if desired, communicate clearly to someone else. Sensing or the Facts- what you have seen or heard. They are behavior descriptions, as if seen from a video camera, without evaluation or ascribing meaning. Thoughts – what you tell yourself the facts mean. They are the interpretations, beliefs, conclusions, or stories you tell yourself about what is going on. Feelings or Emotions – Keep it simple: Happy, sad, mad, or afraid. Wants or intentions– What you think will fix the problem. Doing or Actions – What you actually do. A common problem in relationships that often occurs is the result of confusing FACTS with interpretations about what is happening. Our interpretations generate emotions, and we can be caught up in our anger or hurt because our interpretation is different from our partners. The model helps you to clarify interpretations and emotions by going back to the original sensory data (what you saw, heard or felt) and checking each other’s interpretations. You may or may not get to agreement on the meaning of what you witnessed, but it’s helpful to know what each of you is thinking and perceiving. Speaking as though we know the “other’s” intentions, feelings, or thoughts is offensive. By using “I” statements, we show that we are speaking responsibly about something we should be an authority about – ourselves! Reflective listening consists of slowing the conversation down, while assuring your focus is on being a good listener and not your defense! After a sentence or two, you, the Listener, repeat back in your own words what you think your partner is saying. You then ask if you heard them accurately and completely. You keep trying this until your partner says, “Yes, I feel understood.” Then you switch, and you say a few sentences to your partner, and they repeat what they heard back to you. Get to know yourself. Journal regularly about your experiences using the Awareness Wheel. Learn the difference between FACTS (what you have seen or heard); THOUGHTS (interpretations/ stories I tell myself about the Facts)); EMOTIONS (body-feelings – Happy Sad Mad Afraid); WANTS (goals or intentions – what you think will fix the problem) and the ACTION taken. Keep in simple. Let’s call my clients Joe and Jess. Jess comes home after a frustrating, but productive day at work. She gets out of her car, and notices, again, the dead spots on the lawn (sensory data). She scowls (feelings- anger) and thinks (thoughts), “How many times do I have to ask Joe to fix the sprinklers!! !” (Wants and actions). Jess goes into the kitchen to find her mother feeding the kids their dinner, and is so thankful that she at least has her mother! Jess thinks she wants a divorce. Because Jess has worked with me for a while, she decides to not act on all these conclusions, but goes to her room to journal about first. “ok, so WHATS the issue?”. I don’t feel supported; and I’d like a more equal partnership. Can I talk to you about some things? (Invites participation). Ok. This is just my perception, ok? When I got home today, I noticed the dead grass again, then I walked in to find you watching TV while mom was feeding our kids. (SENSORY DATA). And I Thought to myself ‘Joe isn’t taking our talks seriously!’ … because – I mean – how many times have I asked you to help me take care of the house better? How many times have I told you that the kids need more time with you (prior Wants and Actions)?? Naturally, I am incredibly frustrated (Feelings)! I’m seriously getting to the point of giving up (Want), and I may want a divorce. (future Action).